Can you confirm these amateur observations of Elasmodactylus tuberculosus? Types Type: BMNH 1946.8.26.63 (and possibly additional specimens). Diagnosis Diagnosis of the genus: Elasmodactylus may be diagnosed by the following suite of characteristics: body large, robust (adults > 75 mm SVL); skull surface smooth; digit I of manus and pes hyperphalangic (phalangeal formulae 3-3-4-5-3 manus and 3-3-4-5-4 pes), digits broadly dilated, bearing 8-14 undivided subdigital lamellae beneath digit IV of pes, lacking paraphalanges and interdigital webbing; males with series of precloacal pores; tail depressed; dorsal skin tuberculate, fragile. Precloacal pores are primitively absent in the Pachydactylus Group as a whole, and independent reversals have occurred in Elasmodactylus and some Rhoptropus (Bauer & Good 1996). Fragile skin, which may be used in regional integumentary loss, a predator escape strategy (Bauer et al. 1989; Bauer et al. 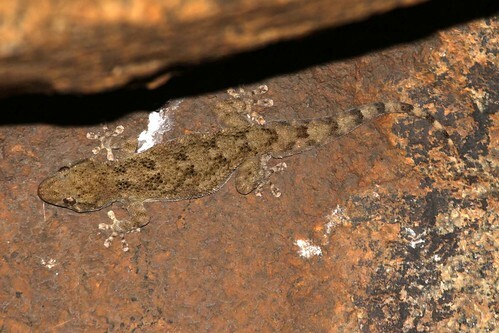 1993), has apparently evolved independently in Elasmodactylus and the P. namaquensis group (from BAUER & LAMB 2005). Comment Type Species: Elasmodactylus tuberculosus BOULENGER 1895 is the type species of the genus Elasmodactylus BOULENGER 1895. Tornier,G. 1897. Die Kriechthiere Deutsch-Ostafrikas. Beiträge zur Systematik und Descendenzlehre. D. Reimer, Berlin, 164 pp.